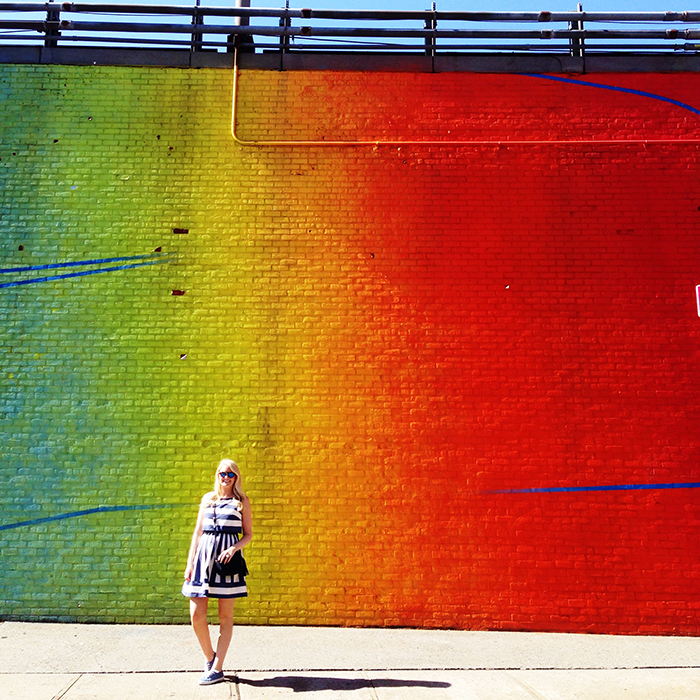 This past Sunday I spent the entire day exploring all that Brooklyn has to offer. It was my first time to visit this part of New York, and it was definitely worth the trek over the Brooklyn Bridge. The area was more quiet and much less busy than bustling Manhattan – the streets wider, the brownstones bigger and the neighborhoods cleaner. DUMBO (which is where we shot the colorful wall you see above and the shot of the Manhattan bridge from the street) is a quaint little area with a bunch of great boutiques and book stores. It also has this adorable place for cookies and coffee called One Girl Cookies, which had the most delicious ham and parmesan scones! After we picked up our scones, we sidled over to the park by Jane’s Carousel to enjoy the sunshine for a couple hours. Before lunch, we walked through Brooklyn Heights which is one of the more beautiful neighborhoods I’ve seen in New York. Each stoop is lined with flowers and well-kept – Brooklyn Heights has such breathtaking streets to walk and see all of the real estate. 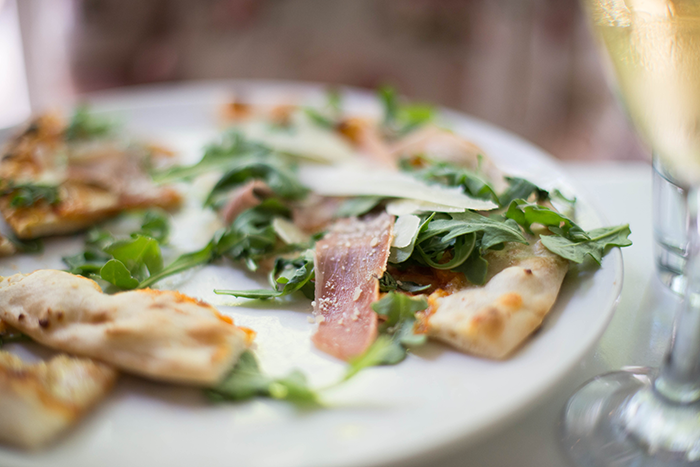 For lunch, we stopped in a small Italian eatery in the heart of Brooklyn Heights. The food was rich and delicious, aka everything I’m looking for when on vacation! Basically, Brooklyn is a new favorite destination of mine when visiting New York. Absolutely worth a trip if you’ve never been before! 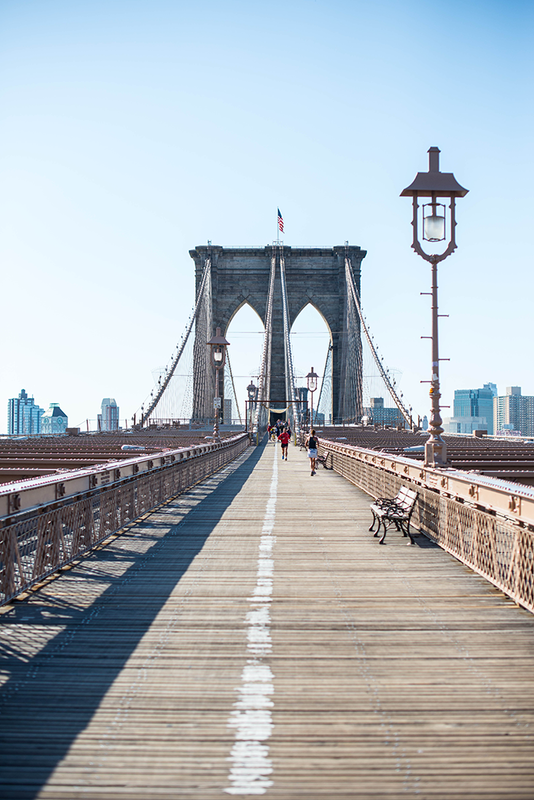 For the walk over the Brooklyn Bridge, I needed a sturdy pair of comfortable shoes – I opted for my Old Navy sneakers which kept me happy all day. This striped sundress by Pim & Larkin at Piperlime was the ideal choice for a day out, don’t you think? It’s under $150, so the dress was an easy sell for me. Popped on my new favorite pair of sunnies and my go-to crossbody bag and I was good to go! Tomorrow I’m hopping on a ferry to go to Liberty State Park for Veuve Clicquot’s annual Polo Classic – it’s supposed to be a gorgeous, sunny day, so I’m looking forward to sipping on bubbly with the best of New York! Click here to follow along on Instagram for an insider look at the fun day-long event. PS – today is the last day to enter the LuisaViaRoma giveaway for a $750 gift card! If you haven’t entered yet, do it right now by entering here. Click here for more details and to enter! Sounds like the perfect sunday, I love you sunnies. I love this refreshing look! You make even the lower priced items look more high-end with how you put it all together. I am also enjoying your pics from NYC..I miss that city. LOVE this dress and these pictures are gorgeous!! Love this look Merritt! That dress is such a wonderful find, it is just my style. Navy and White are my go-to’s and I dont think I ever saw a stripe pattern that I didn’t like. With the dress’s reasonable price point I might just have to go right ahead and purchase it! 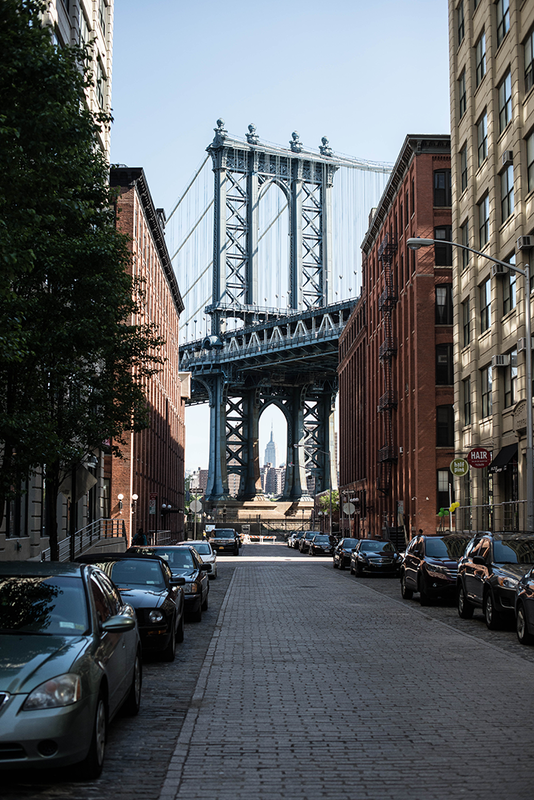 So fun that you went to Brooklyn for the first time, it is such a great area that is often overlooked and always worth a visit. Your pictures of the Brooklyn Bridge are just perfect! Have a wonderful weekend! Great summer great!!! Amazing pics of Brooklyn! I’m super jelly of your trip!! Enjoy the polo event this weekend!! SO fun! Your pictures are beautiful! 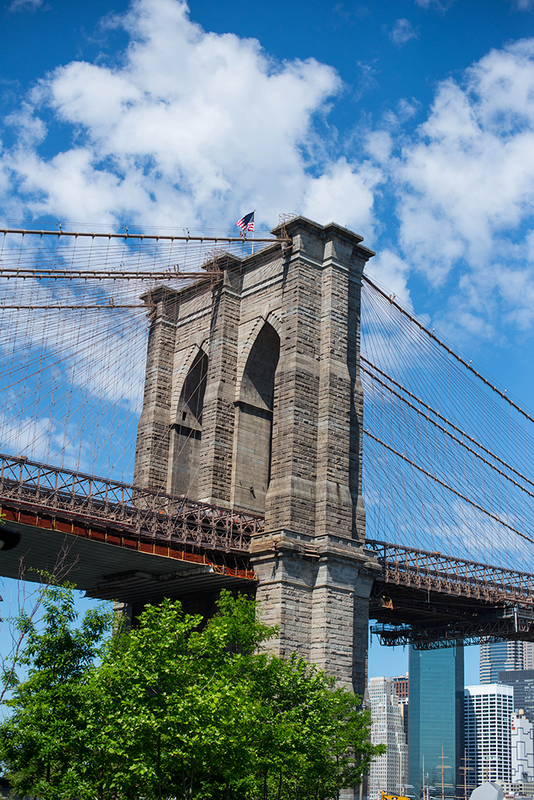 It sounds like you had an amazing time in Brooklyn! I never make it over the bridge, but I might have to next time I’m in NYC. That is dress is beautiful. Have fun at the polo match this weekend! Love that dress…and great pics of Brooklyn!! You look gorgeous, as always! Love the stripes! Pictures look wonderful, makes me want to head up to NY for a little getaway! Ah, that wall is gorgeous! My dad loves Brooklyn Heights, he consulted in NYC last year for a few months and actually rented a place in Brooklyn Heights! I can’t wait to see your new blog next week :)!! I love this! The two times I went to New York it was too cold to walk over the Brooklyn Bridge so I’m dying to go back and do just that. I also stayed in Manhattan but did the Brooklyn tour but I definitely did not have time to explore.. it looks amazing! Perfect outfit for a day out!! Ugh, I really wish I could wear this dress without looking like a big balloon… Maybe I’ll buy it and save it. lol. You look great! The photos are amazing and you look adorable!!!! Gorgeous photos! And that food is making me so hungry right now! YUM! Love this look Merritt! I want to look that chic when traveling. Love the sunglasses too! great photos!! looks like a fab trip! Such a cute, nautical look! And that rainbow painted background is amazing! Love the adorable striped dress and the great Brooklyn shots! You were in my neighborhood! I didn’t venture to Brooklyn when I was there last year, and now I’m regretting that decision. I’ll add it to my never-ending wanderlust list. BTW, stunning snaps, and two thumbs up for your low-key yet lovely look. 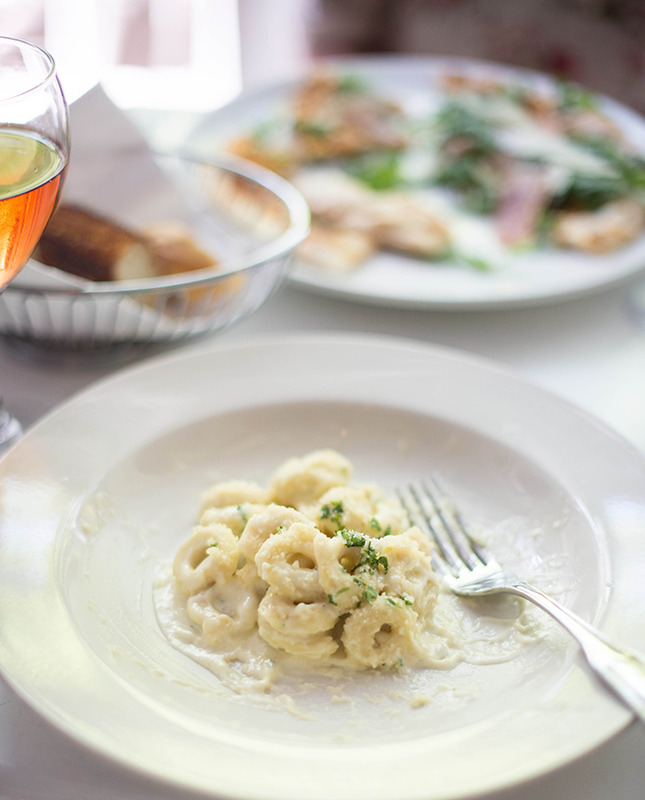 Have a wonderful weekend, Merritt! So I love that outfit but the tortellini looks AMAZING – where’s it from!?! Love your chic comfy look! Sneakers are my new obsession! I love Brooklyn, I stayed at the Wythe Hotel last time and the bar on the rooftop is amazing! That dress is so cute! I love it. These photos are fantastic. I love NYC. Stunning photos and outfit! Looks like an amazing place to explore. That wall is so neat! That is one beautiful striped dress and I love the pictures. I’ve been there once when I was little, and I would love to go back, so beautiful. Looks like you’re enjoying NYC. Love the dress! Love Brooklyn! Such a great place to escape the hustle and bustle for a NYC visit. The views are stunning, too! What a great striped dress! I really love how you’ve paired it with canvas sneakers for a perfect weekend look fit to traverse the city. I love these separates! So cute!!! I love the modernized 50s throwback look! Love your photos & blog! I’ve lived in nyc for 2 years and still have yet to walk the Brooklyn Bridge- need to do that stat!